Une-deux senses: French Macarons Galore! 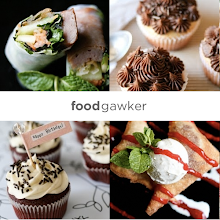 Fellow food bloggers/ bakers, I have a question for you! So I have this problem... sometimes, when I bake the various things that I bake, I really want to be truthful in my description of how the things taste, how they turned out, or how difficult they were to make. The most difficult thing for me though is how things taste. I know, I know! It really shouldn't be that hard to tell you guys if something is delicious or not but sometimes I really over-think things and examine things to the fine details rather than focusing on the overall deliciousness of the thing! Weird, but I can't help it. 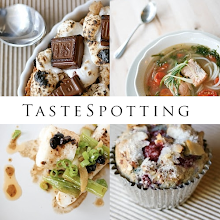 Anyway, that's why I always have taste testers - they sure do help a lot with my weird taste bud issues! So, after all that, on to these macarons! Along with the lavender & vanilla bean macarons I posted a while ago, I made ALL of these too! It was my best friend's birthday and I knew that these would make thee perfect gift, and would let me practice my macaron-making skills, well so I'd hoped. Weirdly enough, some came out perfect. As for the others, I could not say the same. This was probably due to the fact that I was rushing my macaron making. At first, when tasting them, I was blinded by their slight imperfections. I overcooked the green tea macarons a bit, so they were a bit brown. They were also oddly shaped and didn't have the perfect little feet that I so dreamed of! The lemon though, looked flawless. But besides all of this, my friend told me that they were everything she could have asked for. Yay! 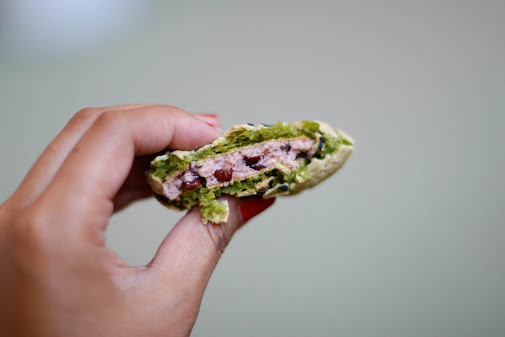 Her favorite were the green tea flavored ones, both the adzuki bean and the passionfruit. 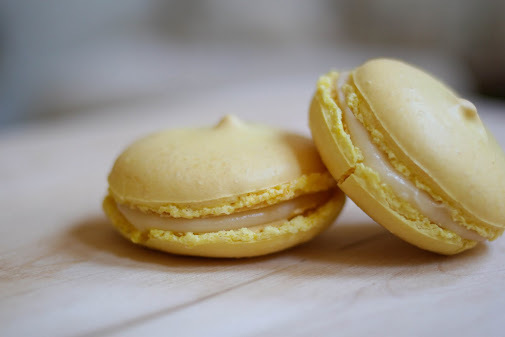 I liked the passionfruit a lot because of the tangy and sweet passionfruit buttercream. I also really liked the earthiness that the green tea added to the shells. The lemon mascarpone were also really delicious, super tangy but sweet and I think one of the most beautiful, with perfect smooth shells and some feet! 1 cup powdered sugar + 4 tsp. 1/2 cup almond powder or meal + 2 tsp. Preheat the oven to 350 F. Line two baking sheets with parchment paper. Have a pastry bag with a plain tip (about 1/2 inch) ready. In a blender or food processor, grind together the powdered sugar, almond powder/ meal and matcha to make sure there are no lumps. Add the green food coloring to your desired shade of green into the granulated sugar and mix until combined. In the bowl of a standing electric mixer, beat the egg whites until they begin to rise and hold their shape. While whipping, beat in the dyed sugar until very stiff and firm, about 2 minutes. Carefully fold in the dry ingredients, in two batches, into the beaten egg whites with a flexible rubber spatula. When the mixture is smooth and there are no streaks of egg whites, stop folding and scrape the batter into the pastry bag. Pipe the batter on the prepared baking sheet in 1 inch circles (about 1 tbsn. each), evenly spaced 1 inch apart. Tap the baking sheet a few times on the counter to flatten the macarons and let air 'dry' for 1 hour. Bake for 10 - 12 minutes. Let cool completely before removing them. To make the SMBC, put the sugar and egg white in a large heatproof bowl over a saucepan of simmering water and whisk constantly, keeping the mixture over the heat, until it feels hot to the touch, about 3 minutes. The sugar should be dissolved, and the mixture will look like marshmallow cream. Pour the mixture into the bowl of a stand mixer fitted with the whisk attachment and beat on medium speed until it cools and forms a thick, shiny meringue, about 5 minutes. Switch to the paddle attachment, and add the butter, one tablespoon at a time, beating until smooth. Beat on high speed until it is thick and very smooth, about 6 - 10 minutes. 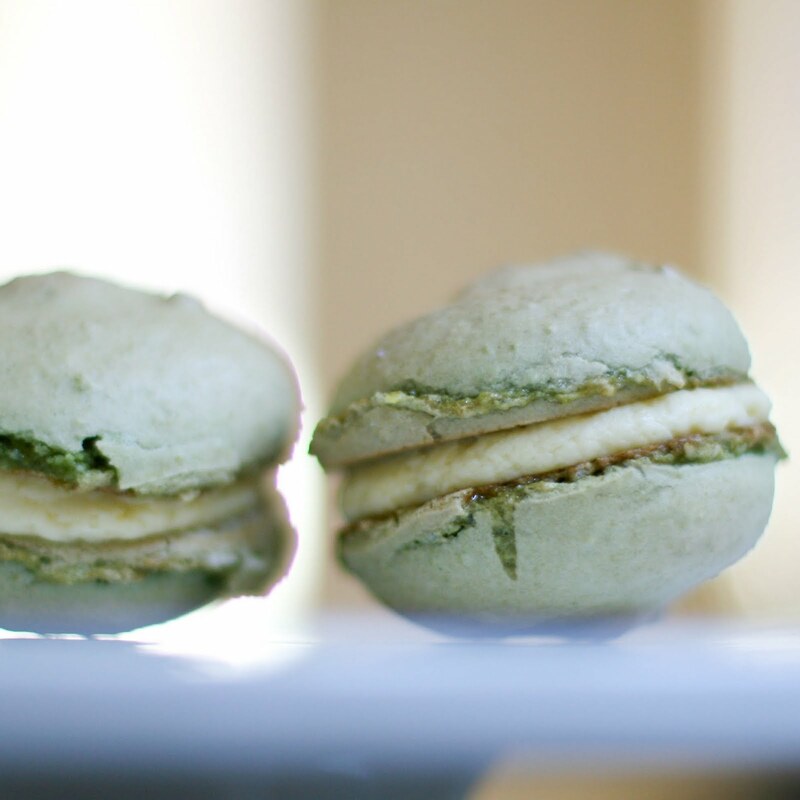 To assemble the macarons, pair the shells off into similar sizes. Take one shell and pipe about 1 tbsn. of the adzui SMBC onto it. Top with the other shell and enjoy! Adapted from here. Filling recipe here. 1 cup powdered sugar + 2 tbsn. 1/2 cup almond powder or meal + 1 tbsn. Preheat the oven to 350 F. Line two baking sheets with parchment paper. Have a pastry bad with a plain tip (about 1/2 inch) ready. In a blender or food processor, grind together the powdered sugar and almond powder/ meal to make sure there are no lumps. Add the yellow food coloring into the granulated sugar and mix until combined. In the bowl of a standing electric mixer, beat the egg whites until they begin to rise and hold their shape. While whipping, beat in the dyed sugar until very stiff and firm, about 2 minutes. Carefully fold in the dry ingredients, in two batches, into the beaten egg whites with a flexible rubber spatula. When the mixture is smooth and there are no streaks of egg whites, stop folding and scrape the batter into the pastry bag. Pipe the batter on the prepared baking sheet in 1 inch circles (about 1 tbsn. each), evenly spaced 1 inch apart. Tap the baking sheet a few times on the counter to flatten the macarons and let air 'dry' for 1 hour. Bake for 10 - 12 minutes. Let cool completely before removing them. To make the filling, beat all the ingredients together until thick and creamy. Chill for 2 - 3 hours before using. 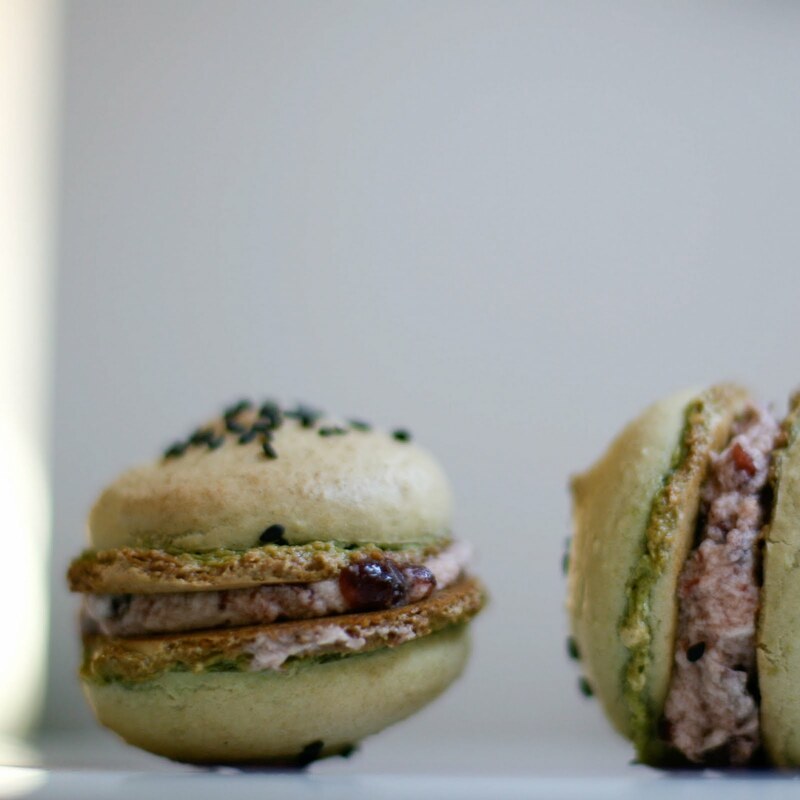 To assemble the macarons, first pair off the shells into similar sizes. Take one shell and pipe the lemon mixture on top (about 1 tbsn. 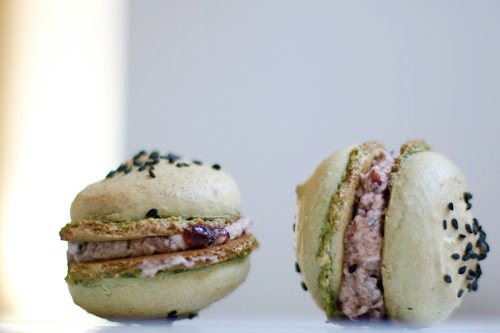 each), then top with the other macaron shell. Enjoy! To make the SMBC, put the sugar and egg white in a large heatproof bowl over a saucepan of simmering water and whisk constantly, keeping the mixture over the heat, until it feels hot to the touch, about 3 minutes. The sugar should be dissolved, and the mixture will look like marshmallow cream. Pour the mixture into the bowl of a stand mixer fitted with the whisk attachment and beat on medium speed until it cools and forms a thick, shiny meringue, about 5 minutes. Switch to the paddle attachment, and add the butter, one tablespoon at a time, beating until smooth. Beat on high speed until it is thick and very smooth, about 6 - 10 minutes. Add passionfruit syrup to taste, but be careful not to add too much or else the buttercream will start to separate. To assemble the macarons, pair the shells off into similar sizes. Take one shell and pipe about 1 tbsn. of the passionfruit SMBC onto it. Top with the other shell and enjoy! hmm i've never had that problem, but I have had problems with macs!!! ugh when will they happen for me!?! These sound and look delicious, especially the green tea passionfruit (!!). Your friend is so lucky to have you, Michelle. I feel ya about the taste issue. And I make sure to have others test everything I make too 8). 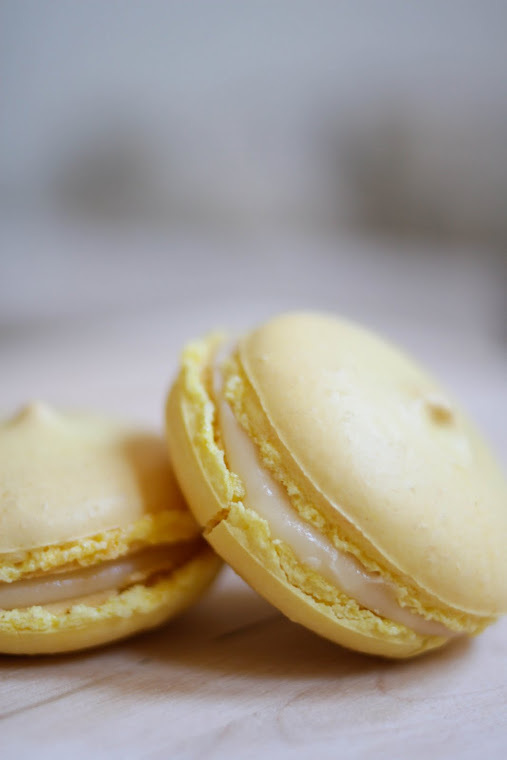 I made macaroons once, but the texture wasn't airy enought (it was a bit chewy). 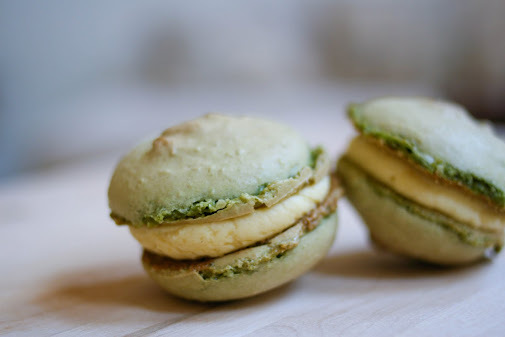 I really really want to bake with matcha power, but getting it is so expensive!